BBC Radio 3 has explored the life and career of a City musician in a new two-hour documentary. The episode of Hear and Now focused on the contributions of virtuoso pianist Dr Ian Pace, Head of Performance in the Department of Music. The programme celebrated Dr Pace’s 50th birthday and featured interviews with the Senior Lecturer as well as recordings of him playing. It was the first time ever that Hear and Now devoted a whole feature to a single performer since it began broadcasting in the mid-1990s. Dr Pace said: “I was delighted to be asked to make this programme by producer Philip Tagney and presenter Rob Worby. The programme featured new recordings by Dr Pace, some of which were among the last to be made in BBC's iconic Maida Vale Studios. These include works of Elliott Carter, Karlheinz Stockhausen and four pieces from a set of 23 written specially for Ian's 50th birthday, which he premiered at City, by Mic Spencer, Evan Johnson, Patrícia Sucena de Almeida and Wieland Hoban. 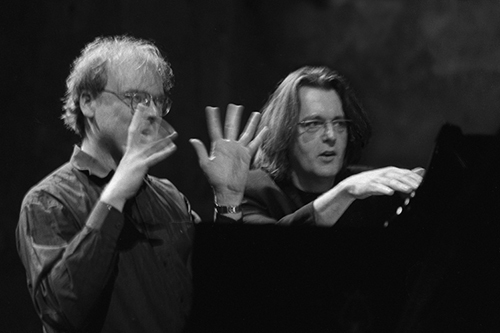 The recordings were broadcast alongside earlier recordings of works of Rebecca Saunders, Pascal Dusapin's (right, with Dr Pace) piano concerto À Quia (with the Orchestre de Paris, conducted by Christoph Eschenbach) and Michael Finnissy. The programme also included a further new recording that was made at City of Brian Ferneyhough's Quirl, for release on a future CD. Dr Pace, who specialises in contemporary music and has premiered many works by the leading composers of our time, said: “There is a wide range of music, some wild, virtuosic, cataclysmic, other pieces which are various sensuous, aloof, estranged, hushed. The Hear and Now programme followed another BBC Radio 3 feature to which Dr Pace contributed earlier in the year. Radio Controlled featured his research into the development of music in Germany after the Second World War. In 2015, Dr Pace also appeared on BBC Radio 3’s Modern Muses programme with composer Michael Finnissy to discuss their 25 years of musical collaboration, including on Finnissy’s five-and-a-half hour piano epic, The History of Photography in Sound. The new programme, titled “Ian Pace, contemporary virtuoso pianist”, is available on the BBC iPlayer.